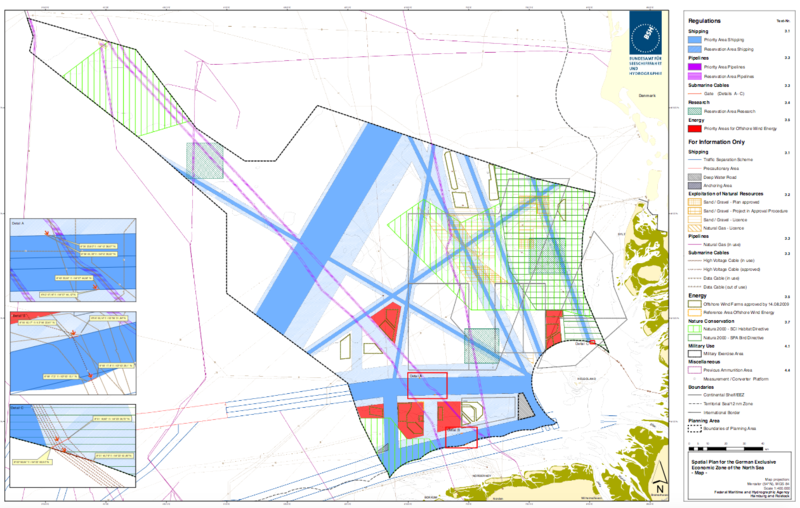 This page introduces students to marine zoning and the classification and regulations in place for territorial waters and EEZs. It begins with a brief look at the tensions in the English Channel between French and British fishermen. It goes on to look at the how territorial waters are defined as well as the role of EEZs. It introduces some of the advantages and disadvantages of EEZs in regard to their scale and then looks in more depth at Germany's Maritime Spatial Plan in terms of managing competing economic interests. Watch the following video that shows recent tensions between British and French fishermen. What caused the tensions between French and British fishermen? What were the legal issues? Despite such low contributions to national GDP why do you think there is such contrasting government regulation over scallop harvesting between France and Britain? How does Brexit change things? Study the following map and discuss what it shows. How do think the map is established? Which countries have the largest EEZ's? What disadvantages do countries like Canada and Russia have with their EEZs? This political map of the world depicts the extent of territories, both on land and at sea (submerged lands), which are under the control of all independent nations. The map incorporates Exclusive Economic Zones (EEZ), which are sea zones whose resources belong to their coastal-lying nations. International law defines these zones as lying within a 200 nautical miles geometrical offsetting of the coast seawards, and, where these geometrical boundaries prove ambiguous, through international treaties. What is the difference between coastal water and territorial seas? How is the Exclusive Economic Zone (EEZ) defined? What is the difference between the EEZ and territorial seas? EEZs are defined by the United Nations Convention on the Law of the Sea (UNCLOS). Throughout the globe, coastal nations have jurisdiction over the natural resources of an Exclusive Economic Zone (EEZ) that extends up to 200 miles off their shores. Within the EEZs, each nation has jurisdiction to govern the use of its marine resources. They may issue licenses, set catch limits, or ban a given activity all together. Increasingly, coastal nations are setting aside territory within their EEZs for conservation, limiting commercial activity and creating no-take zones. The establishment of Marine Protected Areas (MPAs) is on the rise as concern for the sustainability of fish, marine mammals, corals and critical marine ecosystems grows. Setting management policies is one thing, but enforcing them 200 miles from shore is another, especially for countries with large EEZs or small countries with limited resources to patrol their waters. This is where the ability to “see” vessels remotely through Global Fishing Watch can help governments monitor their EEZs, including protected areas, and enforce their resource management strategies. Make a revision sheet that summarizes the sovereignty issues based on a range of places and scales.